This is a picture of the posterior portion inside the eye. The orange / yellow color is the retina. The thin red lines are blood vessles - arteries and veins. The circluar structure on the right is the optic nerve. 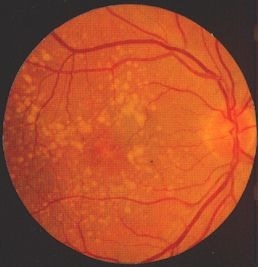 The central deeper orange area is the macula. The macular is the zone of the retina that is responsible for your fine, sharp center vision. When you look directly at an object (small word) that image is focused directly on the macula. It is the "sweet spot" of vision. Conditions and diseases that damage the macula can disort, blur, fog just the central portion of your vision. When waste products from normal cellular functions are not processed well and build up in the retina, small lumps or deposits can form. These small areas are called drusen. Their appearance may be the earliest sign of macular degeneration. At this stage, vision IS NOT affected. They can exist silently. They are only seen during a dilated eye exam. Small round distinct drusen are low risk. Larger indistinct drusen raise the risk for vision loss. This form occurs when a special type of cell, the retinal epithelial pigment "RPE" cell loses function and dies. This cell is important to maintain metabloic activity and health of the vision cells - rods and cones. Without the RPE cells, rods and cones succum to poor nourishment. Since the highest density of rods and cone is in the macula, this area degenerates first and more severely. 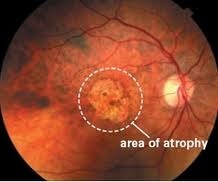 This picture shown an "atrophy" area of PRE cell loss and overlying degeneration. 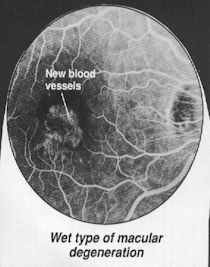 Wet macular degeneration refers to a plasma blister or frank bleeding in the retina. This occur as a consequence of large drusen formation effects or from dry degeneration effects. If either of these two conditions exist, abnormal blood vessles can grow in the retina, then leak or rupture. The picture shows a central bleed. This can result in sudden vison loss. Immediate evaluation and treatment is required. Macular degeneration can be detected and classified by a variety of tests. One test is simple observation with a dilated eye exam. A second test is a fluorescein angiogram. This test involves injecting a safe no-toxic dye into the arm vein and taking pictures of the retina as the dye circulates through the retinal arteries and veins. 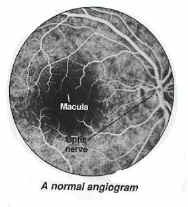 In this fluorescein angiogram, the dye is collecting in the macular area within a nest of abnormal blood vessles. These abnormal blood vessles may leak causing a fluid blister or can rupture causing a retinal bleed. Once rupture occurs, vision may be lost permanently. Detecting these abnormal blood vessles early can allow the ophthalmologist to provide treatment to save your vision. Our office has one of the most sophisticate devices to eveluate the retina for a variety of disease conditions. 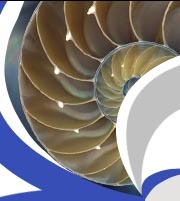 In this case we can examine the retina and all its layers with precision. Any sign or hint of macular degeneration can be studied in detail and then an appropraite course of action taken. 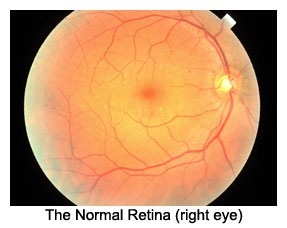 This picture shows the cross section of the normal retinal in the macular zone. 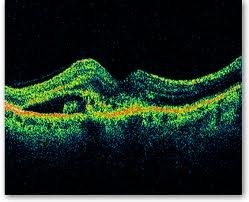 The diffent color bands represent unique layers of retinal vision cells. The Rod and Cone layer is the thick red-orange band. The depression is the eye center FOVEA. This picture show a elevation indicative of fluid blister formation or a frank bleed from wet macular degeneration. Notice the distorted architecture and the dark area left and just above the red-orange band. That is fluid or blood in a pocket in the retinal layers. Treatment success can be demonstrated and monitored by a sequence of OCT pictures. Amsler grid test - The graph paper test pattern helps you the patient detect very early changes in the macula. Early detection allows rapid intervention and saving precious sight. The test is done in a moment. Look at the center dot. notice if all the lines are present and straight. If so, GREAT!! if not, call your local ophthalmologist. Abnormal Amsler grid - in this picture, the lines are bent or warped. There is also a dark spot or shadow. one or both changes can represent fluid blister formation or new bleeding. This is an urgent matter. Call your local ophthalmologist. We are one of a few offices that can test you for the "wet" form risk using only a swab of mouth cells. It takes only a few minutes to do the test collection. Results are available in 1-2 weeks and can help direct our evaluation and management of your condition. It is covered by most insurance plans. Diet - consume a diet rich in deep green, orange, yellow vegetables. Also antioxidant fruits are important too. I recommend visiting these web-stores for a vast assortment of devices.